In the development cycle of a project I have grown fond of using a set of milestone deliverables. The first one is the Alpha Release, which has 80% of functionality and 50% styling. You could see it as a Minimum Viable version of your project, containing those 80% of functionality that are most important to evaluate the user experience. After the alpha comes the Beta Release, which has 100% functionality and 80% styling. The final release is called the Release Candidate and has – next to full functionality and styling – all whistles and bells, including polish and animations. Only at this final stage, your project is ready to go into Quality Assurance with full cross device and cross browser testing. You could call this set of milestones a minimum viable project roadmap. Depending of the complexity of the project (e.g. integration testing, …) extra steps can be added. Experience though has taught me that alpha, beta and release candidate are applicable in almost every situation. The most difficult step for clients to evaluate is the alpha version. People are not used to giving feedback on things that aren’t aesthetically “done”. However it is crucial to get them on board for early feedback as it becomes more difficult towards the end of the project to make fundamental changes. The earlier a change is requested, the easier it is to keep the project on track, on time and within budget. I like using the metaphor of the ugly baby to explain to clients how they should look at the alpha version. An ugly baby has almost all functionalities (10 fingers, 10 toes, 2 eyes, 2 legs,…). It still needs to become mature and is not perfectly proportioned yet, but you get an idea of what it will grow into. And that is exactly how you should look at an alpha version. Don’t get lost into cosmetic details, but look at the key features and evaluate them from a user’s point of view. Giving good and solid feedback on an alpha version will allow you to make necessary changes (or pivot to use lean lingo) early on in your project, without heavily impacting it. P.S. 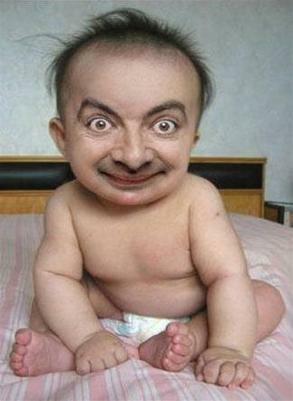 I received the image above from a client, after explaining her the concept of the ugly baby. You can imagine why exactly this image is now connected with this concept in my head.